On February 9th, CBS celebrated 50 years since The Beatles played on the Ed Sullivan Show with TV special ‘The Night That Changed America’. 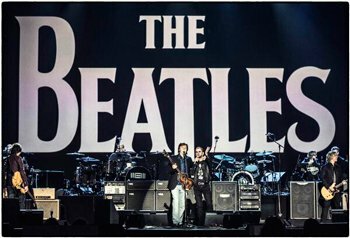 Ringo and Paul reunited once more, to play ‘With A Little Help From My Friends’ and ‘Hey Jude’, as well as singing solo. Dhani Harrison performed ‘Something’, with Joe Walsh and Jeff Lynne, while Olivia Harrison, Sean Lennon and Yoko Ono danced in the front row. The artists that paid tribute were a testimony to how The Beatles influenced generations across all genres. Artists included: Dave Grohl, Eric Idle, Alicia Keys and John Legend, David Letterman, LL COOL J, Maroon 5, John Mayer and Keith Urban, Katy Perry, Brad Paisley and Pharrell Williams, Sean Penn, Ed Sheeran, Gary Clark, Jr., Johnny Depp and Stevie Wonder. Annie Lennox and Dave Stewart also came together for a one-off performance. Above: Paul McCartney tweeted this picture of himself and Ringo rehearsing for the show. Since 1974 Genesis has created signed limited edition books on behalf of authors and artists ranging from the Beatles to Buckingham Palace. Genesis news and special offers direct to inbox.